Hyderabad: The Andhra Pradesh government is in such a deep financial crisis that it is unable to clear pending bills.In the annual Budget, the AP government had projected that at end of the financial year, the revenue deficit would be Rs 415.80 crore. According to finance department officials, the figure has already reached Rs 1,400 crore. Judging by the rate at which the revenue deficit is increasing, it is expected to touch an all-time high of Rs 10,000 crore at the end of 2017-18..The income-expenditure sheet shows that the total expenditure was about Rs 64,000 crore. Of this, the revenue expenditure was more than Rs 57,000 crore and capital expenditure Rs 8,832 crore. The state’s tax and non-tax revenue failed to reach the target projected in the Budget. It had estimated that its own revenue would be Rs 26,343.41 crore but the actual revenue was only Rs 21,882 crore. 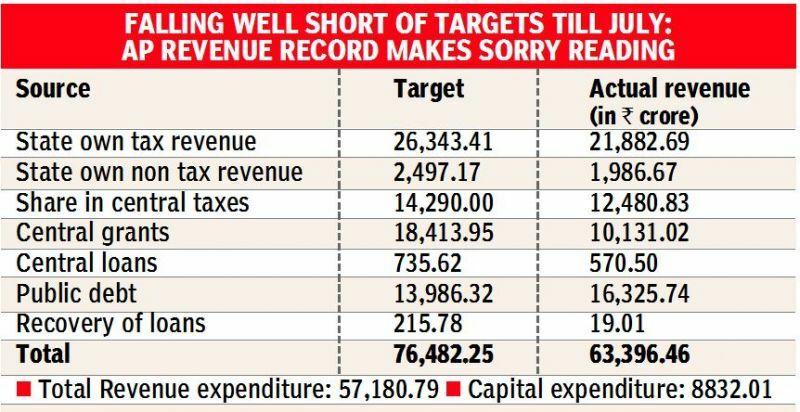 The state government had projected the non-tax revenue at Rs 2,497 crore but the actual revenue was Rs 1,986 crore. The large chunk of expenditure is towards bill payments. The state government has cleared Rs 13000 crore worth of pending bills of the previous financial year. In the current financial year, the state government has received bills to the tune of Rs 50,000 crore and has to clear bills amounting to about Rs 10,000 crore.